Since moving to England, I haven’t been able to participate in Angus Reid surveys (their site only allows Canadian IPs to participate), so instead I’ve been getting my polling participation fix through YouGov. The most recent one I completed was just released and is part of a UK-USA comparison of belief in the devil, demonic possession, and exorcisms. 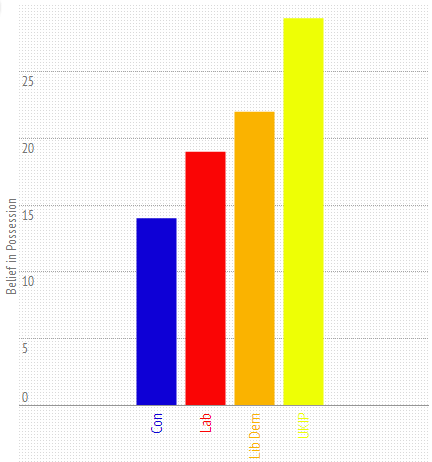 Yes, it’s a Halloween novelty poll. The expected top-line result is that Brits are a more skeptical (or is it sceptical?) 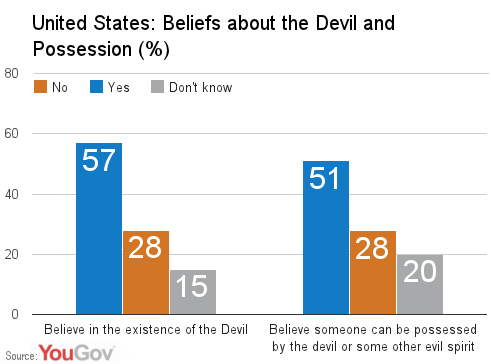 lot than Americans when it comes to belief in the devil. Only 18% admit a belief in the devil, compared to 57% of Americans (including a Supreme Court Judge). Polling by the British Humanist Association has found that 65% of Brits are non-religious, the same number who don’t believe in the devil. America is notoriously more religious but at least 1 in 4 people are starting to doubt the existence of hell. The survey breaks down the demographics for both countries but I’ll concern myself primarily with the UK results. Based on polling size of 1900, we would expect a margin of error of +/- 2.2%, 19 times out of 20 (given a random sample, which this probably isn’t). Breaking down by voting intention, the Conservatives tend to be the most skeptical, while 29% of UKIP supporters believe in demon possession. Both men and women and Brits of all ages are roughly consistent in their beliefs; however, there is an interesting regional trend. 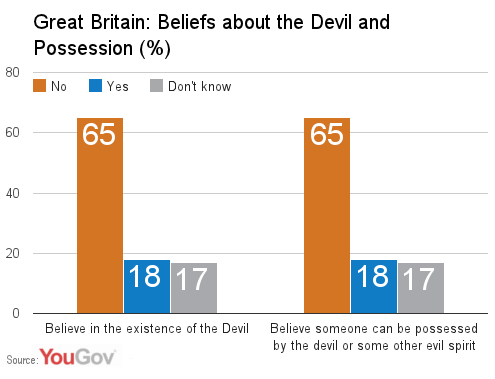 London and the Midlands/Wales both post over 20% belief in the devil and possession, while in the North (go us!) that number drops to 14/15%. Scotland and Southern England are both about average. Belief is also higher among the less economically well off. Unsurprisingly, the religious are more likely to believe in the devil and possessions than the non-religious, with non-Christians showing a sizable lead over Christians (although we’re getting into small samples here). This likely reflects the waning influence of the Church of England and Catholic Church in Britain, as their followers are less fervent in their beliefs. Nevertheless, among the non-religious, 7% believe in the devil and 10% believe in demonic possessions. Of course in any survey like this, there tends to be a few people who want to cause trouble. Furthermore, non-religious is not synonymous with atheist, and disbelief in God doesn’t technically preclude belief in a devil or other supernatural entities. The good news for anyone being possessed is that by a two-to-one margin (35% to 18%), believers in possession also think you can be exorcised. Just ring the trio of American evangelical teens touring London who star in a new BBC Three series. Previous Previous post: Sunday Assembly Schism!